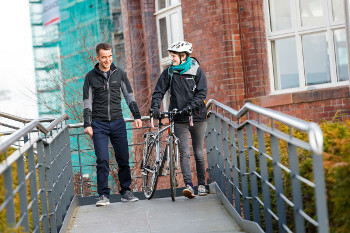 The new Social Housing Fund for Improved Walking and Cycling Facilities is available to housing associations and tenement residential properties across Scotland to support active travel. Transport Scotland said £950,000 from the Scottish Government will prioritise areas of high deprivation in order to encourage walking and cycling for more sustainable everyday journeys. The Scottish Government’s cabinet secretary for transport, infrastructure and connectivity, Michael Matheson, said it had supported similar funds in the past but this is the first time a range of partners have come together to work directly with housing associations. The Scottish Federation of Housing Associations (SFHA) is working in partnership with Cycling Scotland, Living Streets Scotland and Sustrans Scotland. Social landords can apply for grants of up to £25,000 for a range of infrastructure proposals including cycle parking shelters, street furniture such as seating, litter bins, bollards and planters as well as improvements to access points and lighting. See the Cycling Scotland website for details of the fund.